A new club for budding youngsters and adults looking to enter their first triathlon has been launched in Derby, UK. The HUUB Academy is the brainchild of Dean Jackson the owner of triathlon wetsuit and kit company HUUB Design and long-established triathlon coach Hilary Johnson – the mother and coach of elite triathlete twins Tom and David Bishop. Hilary Johnson is a former social worker who has run her own personal training and coaching business, HJ Coaching, for the past three years. A former cyclo cross national champion, she is also the team manager for the East Midlands Inter Regional Championships Triathlon Team and a level three British Triathlon coach and mentor for the organisation. Hilary Johnson explained, “The aim of the HUUB Academy is that it is a friendly and inclusive club – supporting youngsters and adults alike to develop their skills and compete in the growing local triathlon and duathlon calendar. HUUB Design’s Dean Jackson continued, “As triathlon kit designers, we work with some of the top triathletes in the world such as the Brownlee brothers and have always been keen to support younger sports people as part of their elite pathway – including the Bishops. “I have been keen to develop this further and set up an academy to introduce more young people and adults into the sport and support them on their development journey. Our sister company HUUB Events is the driving force behind the Jenson Button Trust Triathlon, which will be held at Markeaton Park on Sunday July 23 and the new Staunton Harold Triathlon on Sunday June 11. 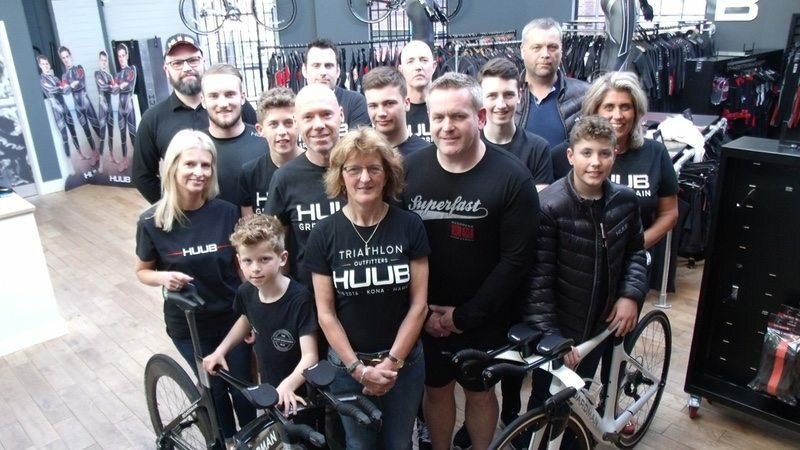 Hilary Johnson added that the HUUB Academy was also important to support young people onto the triathlete elite pathway and following in the footsteps of her sons Tom and David Bishop. 25-year-old twins Tom and David Bishop are both accomplished triathletes and Tom came second in the first ITU event of this year, in Abu Dhabi. He is part of the GB triathlon squad, which is training for Tokyo 2020. Hilary said “The East Midlands is extremely strong in triathlon and we have a number of young athletes who are on the elite pathway with their sights set on international competition. To maintain this momentum, it is important that we support and coach children in the right way and help them to develop on the sporting pathway if that is their goal. The HUUB Academy is working with HUUB Events and Peak Performance triathlon club to stage a Junior Duathlon at Darley Moor race track in Ashbourne on Saturday 27 May. The Junior Duathlon on 27 May is open to youngsters aged 8 to 16. Anyone can enter and entrants do not have to be a member of a club. All they need is a pair of trainers, a roadworthy bike and a bike helmet. Families also have the opportunity to camp overnight free of charge at the race track so that adults can take part in a duathlon for 17-year-olds and over at the venue the following day organised by Crazy Legs Events. The adult duathlon consists of a 5km run and 20km cycle finishing with a further 5km run. Juniors aged 8 and upwards can also be part of the first Staunton Harold Triathlon on 11 June. Here, they will tackle a shorter circuit – swimming 100m before running 1.5km around the estate to finish in front of the house. Competitors in the adult triathlon have a choice of two different distances. The Super sprint will start with a 400m swim in the lake and then a 14km bike ride and 4km run through the estate. The Sprint distance course will be a 750m swim, 28km bike and 8km run. A junior event with shorter distances is also being planned. The Jenson Button Trust Triathlon is positioned as an opportunity for elite, seasoned and novice triathletes as well as teams of three in the Team Challenge, to compete alongside Formula 1 McLaren Honda racing driver Jenson Button in a day of sport. Taking place on Sunday 23 July, everyone will get the chance to race twice. The preliminary will consist of a 200m swim in Markeaton Lake; 10km cycle from the park and on closed roads into the city’s Cathedral Quarter before returning to the park to complete a 2.5km run.